Stephanie Cogdell with Chancellor Randy Woodson at the 2018 Pullen Society luncheon. Now, 24 years later as an alumna, Cogdell is continuing to honor Witherspoon. She has established a planned gift that benefits, in part, the Black Alumni Society’s Augustus Witherspoon Graduate Scholarship Endowment and Lawrence M. Clark Memorial Undergraduate Scholarship funds. “I was very close to both [Clark and Witherspoon]. They helped me get through school,” Cogdell said. Clark, associate provost and professor of mathematics in the College of Education, was instrumental in developing campus programs focused on African-American student experiences, including the African American Symposium. 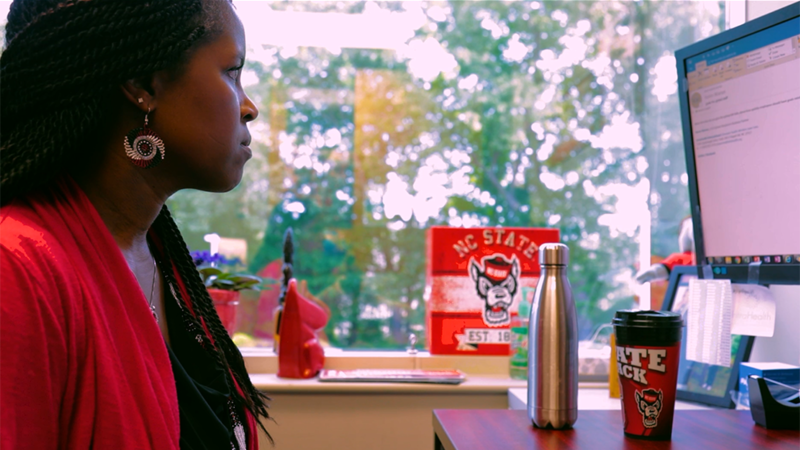 She graduated in 1992 with a degree in psychology, but NC State still feels like home. Not only does Cogdell live in the Raleigh area, but as an active volunteer, she’s never far from campus. She began volunteering with the Black Alumni Society at the suggestion of fellow alumnae Tracey Ray and Diane Becton, assisting with efforts to encourage African-American alumni to return for homecoming. 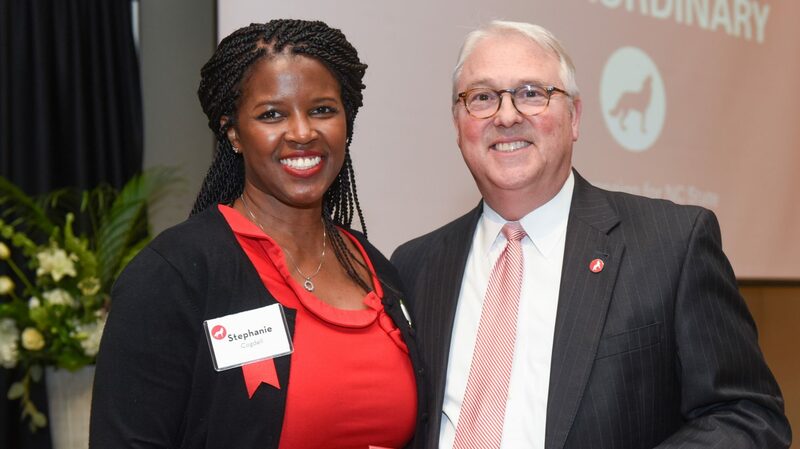 After the success of that endeavor, Cogdell became president of the Black Alumni Society and eventually joined the boards for the Alumni Association and the Wolfpack Club. She was recognized for her leadership with the Alumni Association’s Young Alumna of the Year award in 2010. When Cogdell makes one of her frequent trips to campus, she prioritizes introducing herself to students at events. As a human resources manager at Intrahealth International, a global public health firm, she looks for ways to connect students with the organization’s opportunities in finance, business development and communications. In addition to the Clark and Witherspoon scholarship endowments, her planned gift will also support the College of Humanities and Social Sciences and the women’s basketball program. While she can be found at any number of NC State athletics events, she enjoys women’s basketball the most. “I want to support Coach [Wes] Moore and all the things he’s been doing the university,” she said. Wolfpack athletics were Cogdell’s introduction to NC State – in particular, watching Coach Jim Valvano and the 1983 men’s basketball team make their championship run in the NCAA tournament. Her time as a student overlapped with Valvano’s coaching tenure, and she was impressed by his commitment to the university. Valvano, she said, was a supporter of the students who organized under the leadership of Witherspoon and Clark for the creation of a dedicated space for the African American Cultural Center. One reason Cogdell continues to volunteer and work with undergraduates is to ensure they have guidance and an appreciation for NC State’s history, such as the creation of the center, which opened in 1991. “At one point, it was hard for African-American students to get into the university. And now the university competes for African-American students,” she said. As a volunteer, advocate and dedicated supporter of NC State and its students, she has carried on her mentor’s legacy and created an enduring one of her own. Your gift creates extraordinary student experiences across NC State.